Note: This is the first of a series of at least eight blog posts that I plan to publish over the coming weeks. Make sure you follow my blog so you don’t miss out on the continuing story. If you are new to Cisco Application Centric Infrastructure (ACI) then you may well be daunted at this new method of configuring switches. In this multi-part tutorial, I hope to take some of the configuration pain out of your headache. I will take you through some of the underlying concepts, but do not attempt to explain the theory of ACI, such as VXLAN overlays and the like. This is a configuration tutorial. It takes you through the steps needed to configure a sample ACI fabric. The journey will give you important foundations in naming conventions that will help you understand your configuration in the future, and establish some best practices and conventions that will guide you long into the future. At the completion of the tutorial, you will have a fully configured ACI fabric ready for testing. You are responsible for making sure that all systems are production ready before deployment in a live network. 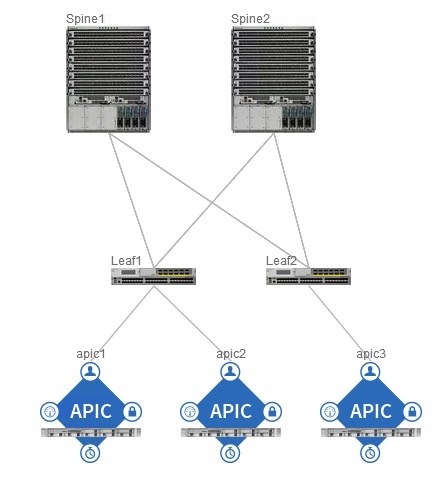 To get the most out of this tutorial, you will need some basic understanding of Cisco ACI and the role of the Application Policy Infrastructure Controller (APIC). Ideally, you will have access to an APIC and an ACI fabric, or the ACI Simulator. Cisco partners/customers with sufficient rights to their CCO login, will be able to get access to an ACI simulator for a few hours at a time by logging on to Cisco dcloud. See this post for a dcloud tutorial. Ciscolive presentation BRKACI-2601 – Real World ACI Deployment and Migration (if you have sufficient rights) – especially from about 13:45 to 35:15, but the whole 90 mins is worth watching. The ACI Fundamentals Guide – about 170 pdf pages. Read the APIC Getting Started Guide. If this link doesn’t work, Google it. You have completed the assigned Out of Band (OOB) Management IP addresses to your APIC(s) and assigned addresses to the TEP pool as described in the “Setting up the APIC” section of the APIC Getting Started Guide. You have a management station logged into the APIC GUI ready to begin configuring your ACI fabric. This tutorial has seven parts, including this one. That’s this first tutorial where I cover the topology I will use, the Lab setup and conventions. You probably know that an ACI Topology consists of Leaf and Spine switches. For this tutorial, I will use two of each, although in truth the spine switches will not feature much at all in the configuration. What will be more important is the equipment that is connected to the leaf switches. I will refer back to this table in Tutorial #4 All about Access Policies – the new “interface range” command. AS I mentioned above, I’ll assume you have completed the assigned Out of Band Management IP addresses to your APIC(s) and assigned addresses to the TEP pool as described in the “Setting up the APIC” section of the APIC Getting Started Guide and can now log into your APIC’s GUI. Already your fabric has begun the discovery process using LLDP, but before you can continue, you will have to register each leaf and spine switch in the APIC. At the completion of this process, the APIC controllers will discover each other and form an APIC Cluster to become a single management unit. means that you should select the main menu item FABRIC, the sub-menu item INVENTORY then expand the POD 1 branch of the Navigation pane, and select the item Leaf 1. Leaf 1 is in bold print because Leaf 1 is a user assigned name – in your case you may have decided to call it L-101 or something different – so you will have to be on the lookout when menu paths have bolded items, if you don’t follow my names exactly, you may have differences. Sometimes, you will need to click in the Work Pane to perform some tasks, and in this case you may find that the work pane has tabs across the top, and possibly another row of tabs under that or even more tabs under that. When you need to click on a tab, the tab name will appear in square brackets after a vertical bar after the item you need to select in the navigation pane, like FABRIC > INVENTORY > Pod 1 | [OPERATIONAL] | [SWITCHES] | [LEAVES], which says, “After you have selected FABRIC > INVENTORY > Pod 1 in the navigation pane, select the OPERATIONAL tab in the Work Pane, then select the tab under that called SWITCHES, and the tab under that called LEAVES. Note: If you are using Cisco dcloud, you may find that this step has already been completed. You should see one item in the list with a NODE ID of 0 and no Node Name. This device is the Leaf switch that your APIC is connected to. Note: Any text you have to enter will be shown in bold italics. Items that you have to select from a list or click on will be shown in bold only. You will have to click on UPDATE to complete the change, but from now on you will have to assume that when I reach the end of a configuration item, you may need to click items like NEXT, FINISH, UPDATE and SUBMIT to complete the configuration. Verify your configuration by selecting FABRIC > INVENTORY > Pod 1 | [OPERATIONAL] |[SWITCHES] | [LEAVES] and FABRIC > INVENTORY > Pod 1 | [OPERATIONAL] |[SWITCHES] | [SPINES]. Note: If you would like the author or one of my colleagues to assist with the setup of your ACI installation, contact acimentor@housley.com.au and refer to this article. Housley works mainly around APJC, but are not restricted to this area. This entry was posted in ACI, ACI configuration, ACI Configuration Tutorial Series#1, ACI Tutorial, Cisco, configuration tutorial, Data Center, Data Centre, Nexus, Nexus 9000, SDN, Software Defined Networking, tutorial and tagged ACI, ACI configuration, ANP, APIC, Application Centric Infrastructure, Cisco, configuration tutorial, EPG, Nexus 9000, Nexus 9K, SDN, Software-defined networking, tutorial. Bookmark the permalink.